There are certain styles of football that we think are not good for youth football. Going Empty or No Backs or even spreading the field out happens to be a some of them. It basically serves no purpose to help get better at what matters. What matters is the kids and if they are not getting lined up and playing fundamental football everyone loses. The kids on both sides of the ball lose. The competitiveness of the actual game taking place is compromised and yes it is even bad for the overall big picture for football because as the skills decline so does the game itself. We have taken a very simplistic approach with our youth football sections in FirstDown Playbook. Our formations are designed for quarterbacks who cannot throw the ball very well and that is 99.99 percent of them at this age. As we have grown our youth football section over the years we have heard from many of you who have suggested that you play against coaches who like to watch TV and run the spread type offenses that they learn or think they learn from watching on Saturdays. That is why this year after we complete the basic upgrades to our youth football offensive and defensive sections we are going to specifically take aim at these offenses. Our goal will be to help you eliminate them. We will give our FirstDown PlayBook coaches specific game plans on defense to run your opponent out of a spread offense and get those receivers back next to the tackle where they should be unless that ten year old QB can throw better than we think he can. So for now continue to enjoy the fundamental football plays and schemes we are providing our FirstDown PlayBook members but as we draw closer to the season be on the lookout for these special packages that will take aim at the youth football spread offenses! 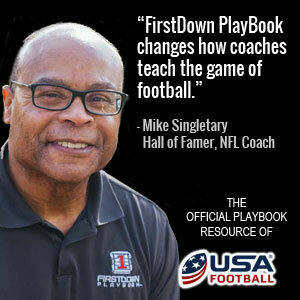 FirstDown PlayBook is the only Digital Football PlayBook that gives you access to thousands of football plays, schemes and technique help and is the official playbook resource for USA Football. FirstDown PlayBook is on Twitter , Google+ and Facebook.